Next day mother had a quiet talk with cook, and cook said she didn't mind if she stayed on a bit, just to see. Sadly, classism, sexism and racism did dampen my enjoyment of this otherwise fantastic children's book. While I really enjoyed the writing style of the book, especially the arch little comments on human behaviour, it was hard for me to get past the casual "oh those poor childish savages" racism inherent in books from this era. Delightful Edwardian flying carpet larks. Second book in the 'Five Children and It' trilogy. The endearing 'n' pompous Phoenix is one of my favourite characters in literature. Did not like this book as much as 'Five Children and It'. I felt the children had better adventures in the first book with the Psammead than they did with the Phoenix or the carpet....I guess they made better wishes in the first book than the second. "I daresay they're not real cats," said Jane madly, "Perhaps they're only dream-cats." "I'll dream-cat you, my lady," was the brief response of the force." I loved this book and the series as a young girl. 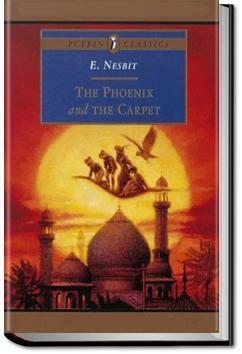 This book transported me with its imaginative plot and made me want to be one of the lucky children on a magic carpet!